Android Nougat 7.1 ROM, Lineage OS 14.1 for LG G4 has now arrived via an UNOFFICIAL and also the OFFICIAL build. If you want some more Lineage ROMs for other device(s) then stay tuned the Lineage OS 14.1 ROM collection page. Before this there was the CM14.1 for LG G4. This Lineage OS 14.1 for LG G4 (h815) is brought to you by developer J0SH1X. THIS IS AN INITIAL BUILD WHICH MAY NOT BOOT AT ALL. HAVE A BACKUP BEFORE FLASHING THIS AND TRY AT YOUR OWN RISK. Installing a custom ROM on a LG G4 (h815) requires the bootloader to be unlocked on the LG G4 (h815) phone, which may VOID your warranty and may delete all your data. Before proceeding further you may consider backup all data on the phone. You are the only person doing changes to your phone and I cannot be held responsible for the mistakes done by you. – Here is theTWRP update guide for the LG G4 (h815). This TWRP recovery guide requires an unlocked bootloader on the LG G4 (h815). Download and Copy the GApps and Lineage OS 14.1 for LG G4 ROM ZIP to your phone. First flash the Lineage OS 14.1 for LG G4 ROM ZIP from device. Then flash the GApps zip from your device memory. Reboot and Enjoy the Nougat 7.1 Lineage OS 14.1 ROM for LG G4 (h815). 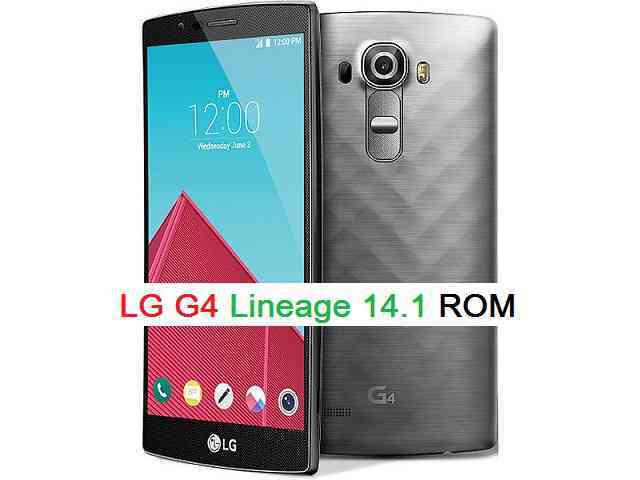 Copy the latest Lineage OS 14.1 for LG G4 ROM ZIP file to your phone. Stay tuned or Subscribe to the LG G4 (h815) forum For other Android Nougat ROMs, Lineage OS 14.1 ROMs, other ROMs and all other device specific topics. Hello im new here but i tested this rom and it work wonderfull .Sorry for my bad english … i see some issues. For me sometimes bigcore draing baterry fast. wifi working nice . Mobile data too with lte verry nice. Nice to be see cpu freq in option for developers. INTERNET APP CRASHING SOMETIMES. Report bug not working. Phone make 77 k on new antutu benchmark is super, I play game verry fast and smooth but my phone is verry hot in a while.Audio quality is mega nice! Fast charging not working i see on screen slow charging. No see multi window in option cant play 2 app on screen.Now its all maybe later i write more. Thanks for nice rom for daily use! I have updated the OFFICIAL Lineage OS 14.1 build for the LG G4 (h815). Can you try the OFFICIAL build and see if the fast charging is FIXED, benchmark score, battery heat issue etc? ?